Sears Canada has a wide variety of products including apparel, toys, shoes, beauty products, home decorations, furniture, mattresses, bed & bath, appliances, electronics, fitness & health and tools. Sears Canada offers popular brand names like Craftsman, DeWalt, Bosch, Black & Decker, Sony, Electrolux, Kenmore, Frigidaire, Whirlpool, Samsung, Maytag, Panasonic, Hoover, Nike, Reebok, Adidas, Sean John, and Levi's. Visit 58Coupons to learn about the best discounts, promotions and coupons available for Sears Canada. Enjoy shipping as low as $4.95 on your orders from Sears.ca. Or pick up at the store for free. Some exclusions apply, click link for details. 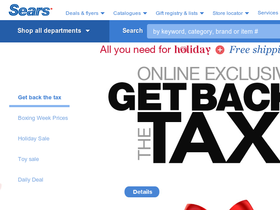 Use this coupon code and save $10 on your order from Sears.ca. Click link and start shopping. Shop Sears.ca and save up to 20% on dehumidifiers. Click link to shop now. Find new deals everyday at Sears.ca and save up to 50%! Click link to see today's deal. For a limited time save up to 50% on select items during Sears.ca's warehouse sale event. Hurry, this is a limited time offer. Visit Sears.ca and find fabulous wedding dresses for under $100! Click link and shop.